Recombinant human His-Fak1 (aa 706-1052) protein purified from E. coli. Focal adhesion kinase subfamily consists of the non-receptor proline-rich protein tyrosine kinases (PTKs). Two members of the family are focal adhesion kinase (FAK) and proline-rich tyrosine kinase 2 (PYK2). These two kinases have molecular mass between 110-125 kDa and are closely related in their structure. The presence of two proline-rich motifs within the C-terminal domains is conserved. FAK is a nonreceptor and nonmembrane associated PTK which does not contain Src homology 2 (SH2) or SH3 protein interaction domains. The centrally located kinase domain of FAK is flanked by large N- and C-terminal noncatalytic domains. FAK links integrin receptors to intracellular signaling pathways that are important for cell growth, survival, and migration. Integrin receptor engagement with ligands such as fibronectin can stimulate FAK autophosphorylation which enables FAK to function within a network of integrin-stimulated signaling pathways leading to the activation of targets such as the ERK and JNK/mitogen-activated protein kinase pathways. Recent study reveals that FAK is essential for angiogenesis in the embryo, functions in heart development and modulates the response of cardiomyocytes to pressure overload in adult mice. Non-receptor protein-tyrosine kinase implicated in signaling pathways involved in cell motility, proliferation and apoptosis. Activated by tyrosine-phosphorylation in response to either integrin clustering induced by cell adhesion or antibody cross-linking, or via G-protein coupled receptor (GPCR) occupancy by ligands such as bombesin or lysophosphatidic acid, or via LDL receptor occupancy. 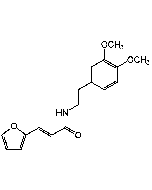 Plays a potential role in oncogenic transformations resulting in increased kinase activity.